Stadio Adriatico, in full Stadio Adriatico Giovanni Cornacchia, opened in 1955. The stadium was built as part of a round of investments for the 1960 Olympics in Rome and hosted a few games during the football tournament. Stadio Adriatico officially opened on 29 December 1955 with a friendly between Pescara and Como. The stadium could initially hold 10,000 spectators. In 1977, a second tier was built on top of the stadium bringing capacity to 40,000, which was reduced again in the late 1980s to 26,000 following safety requirements. Smaller refurbishments in the last few years have brought capacity down to just over 20,000. Over the years, Stadio Adriatico, one of the few with an athletics tracks in Italy, regularly hosted athletics events, including the 2009 Mediterranean Games. 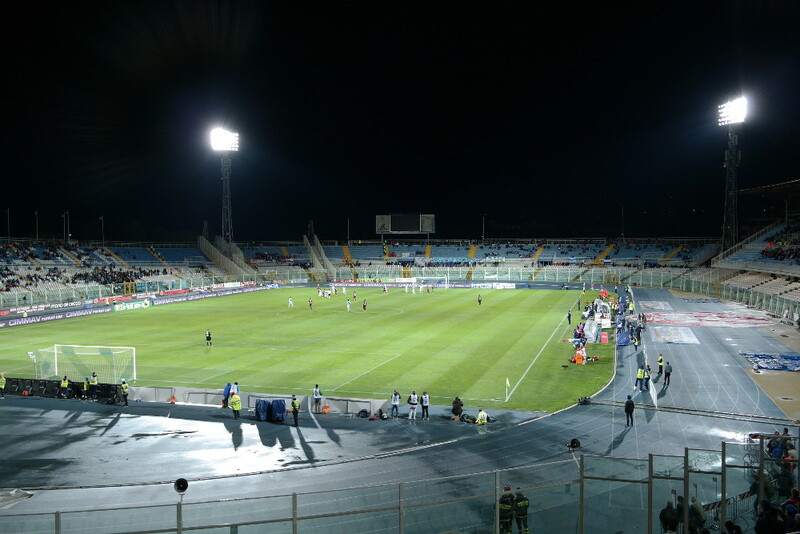 Stadio Adriatico is located in the Portanuova area in the south of Pescara at roughly 2.5 kilometres of the city centre and main railway station. It’s about a 30-minute walk from the rail station and the central Piazza della Rinascita. The stadium lies only a few hundred metres away from the the beach and a 20-minute walk from the Corso Manthone with its bars. It’s a pleasant walk, but alternatively you can catch either bus 1, 2, 10, or 21. There are a few direct trains a day connecting Pescara with Rome and Milan (via Bologna and Rimini). The journey from the former takes just under 3.5 hours and that from the latter 4-5 hours. Tickets for Pescara games can be bought online through Ticketone, at the official club store at the Viale Regina Margherita 3 in Pescara’s city centre right off Piazza della Rinascita, or at one of the Ticketone sales outlets. There are various Ticketone outlets near Stadio Adriatico, including La Voce dei Pescaresi at the Via Alessendro Valignani 9/11 and Tabaccheria Camaioni at Via B. Croce 199. Tickets for most matches will be easily available, but Pescara do tend to sell out a few high-profile games. Tickets for a regular game range in price from €15.00 for a seat at one of the curves to €100.00 for the best seats at the main stand. Tickets for the other side go for €20.00 or €30.00. Prices are increased for seven high-profile games with either €5.00 or €10.00 for most seats but more for those at the main stand. Email biglietteria@pescaracalcio.com for more information. Pescaracalcio.com – Official website of Pescara Calcio. Abruzzoturismo.it – Tourist information for the Abruzzo region.